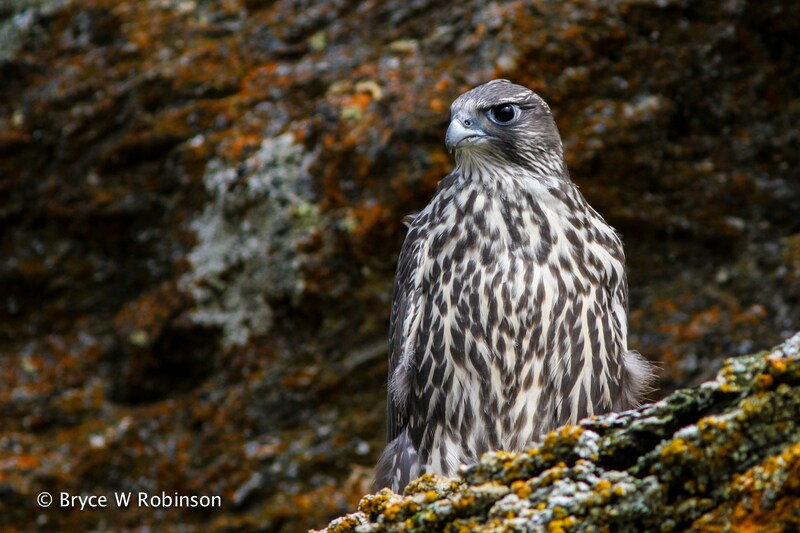 Juvenile Gyrfalcon – Falco rusticolus. Image taken 7 July, 2014 at an eyrie in Western Alaska. I’m working on research that is meant to highlight the key parts of what Gyrfalcons eat while they are raising their young, and how any changes may impact their ability to thrive. I’ve gained an appreciation for the amount of effort and energy that is required to transform an egg into a Gyrfalcon capable of flight. The entire lives of the parents during this period revolves around the need for food and the care of the young. It is an impressive spectacle, and a wonder that they are able to put out young so successfully. Additionally, I’ve come to an appreciation of the fact that the existence of these creatures depends solely on the destruction of other life. They destroy to thrive. This fact seems almost antithetical, but it touches upon an absolute in nature. That absolute is that both the burgeon and termination of life is all part of the natural flow of energy. This absolute keeps me on my path to explore birdlife and ensure that this flow continues for as long as I am responsible. Hi Bryce, I’m currently a college freshman with a deep admiration for birds and wildlife. I’ve been following your blog for the last year or so when I was in high school and noticed that we share many of the same interests for particular raptor species. I’ve also been deeply intrigued by the questions you bring up in each of your blog entries and did a fair amount of research to find the answers to them. Currently, I’m pursuing an engineering degree and was wondering if I could get some sort of contact info to ask you for some advice. I understand that you are very busy, but would greatly appreciate your insight. Thanks for the comment. I’m very glad you enjoy the blog. I’ll send you my contact information, and feel free to get in touch with me anytime.